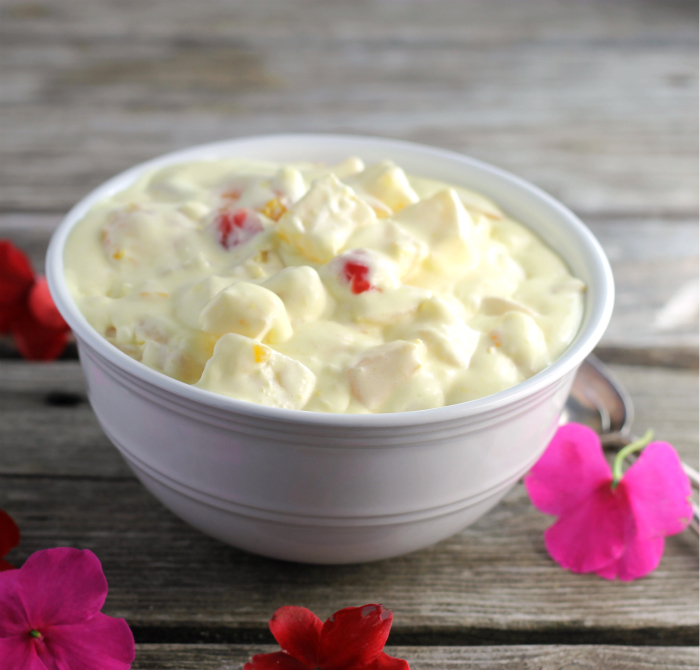 This creamy fruit salad has been one of the favorite salads in our house for many years. I was given the recipe by my sister-in-law when I was first married. We celebrated our granddaughter’s 4th birthday this weekend. It is so hard to believe that she is 4 years old already. She starts preschool next week. Wow! I really find it hard to believe. Can someone slow time just a bit? It’s going way too fast. Our granddaughter’s birthday party was on Sunday and I was in charge of the fruit salad. I wanted to make a new salad, something that I could bring to the party but also share on this blog. You know, killing two birds with one stone… as the saying goes. But with the busy weekend, I didn’t have time to think of something new. So I turned to an old favorite, creamy fruit salad. Something that I knew everyone would enjoy and something that is fast to make. Oh, and one more thing about this salad it makes a lot, enough to feed a lot of people. 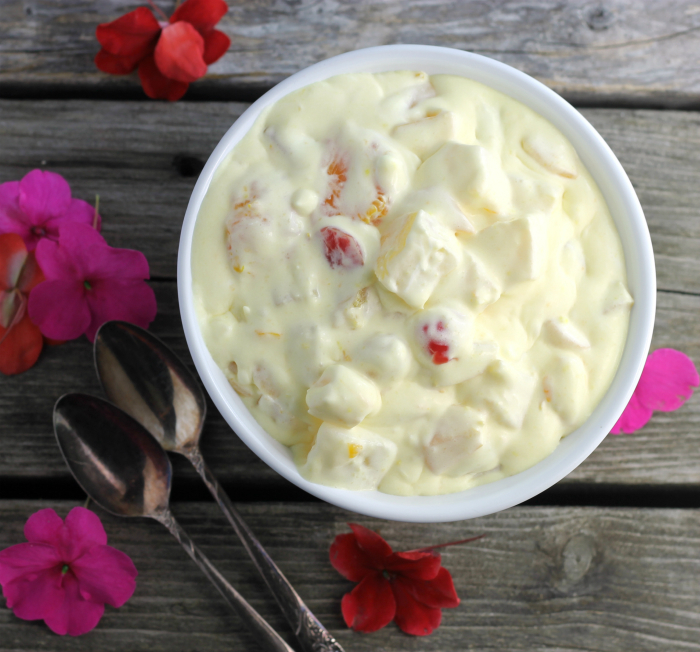 This creamy fruit salad can be made at any time of the year with ease. It uses all canned fruit; I like to go with the fruit that is packed in its natural juices. A couple of small packages of instant vanilla pudding and a small container of cool whip and you are set to go. 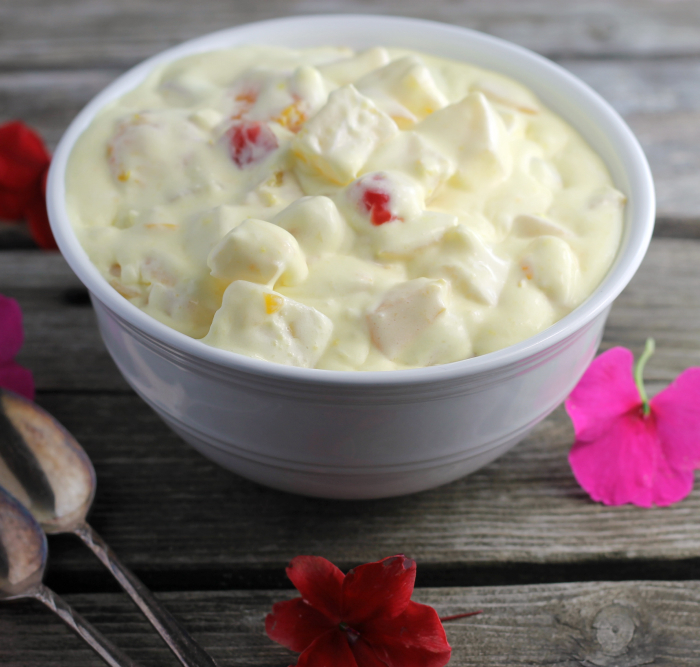 Another thing that I like about this creamy fruit salad is that it last for days in the refrigerator. It makes a large salad so normally I have leftovers for a few days. And even if you have it a couple of days after it is made it will taste just as yummy as it did the day that it was made. If you are looking for a crowd pleaser, try this salad, you won’t hear any complaints. Cut the peaches into bite size pieces. In a large bowl combine all of the fruit with the juice, except the juice of the mandarin oranges. The juice of the mandarin oranges will be discarded. Stir in the cool whip. Add the pudding and mix until everything is combined well. Place in the refrigerator and allow the salad to set up for a least 15 minutes. Have never had anything like this…I usually enjoy fruits just as they are..it looks very creamy. 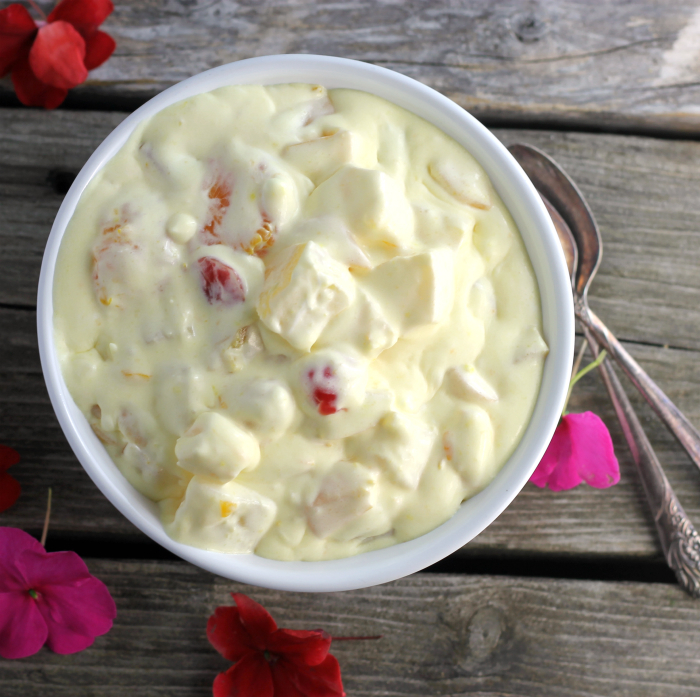 I have a special place in my heart for vanilla pudding…and I love the sound of this fruit salad! I’ve never had anything quite like it, but I can see how it would be delicious. And don’t tell me that time passes too fast…I know that one firsthand! Robbie is already 9+ months old, and it seems like yesterday that we were coming home from the hospital. Crazy!! I had this salad years ago but never knew how it was prepared…thanks for the recipe. Love this fruit salad Dawn, look wonderful!! Your pictures came out great. So bright and makes me want to eat the food that you make. What a delicious sounding salad! I don’t think it would last very long here. I’m curious about the vanilla pudding – I bet it adds lots of great flavor. Happy Birthday to your granddaughter! 4 is a fun age. I am literally drooling. This looks so good!